Every year, more and more clients come in complaining of generalized pain around the kneecap (patella) aggravated by activities such as squatting, stair climbing, or hiking over hilly terrain. Symptoms typically worsen during prolonged knee flexion (i.e., long car rides, sitting in class or in a movie theater). 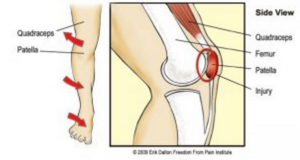 Clients often carry with them a diagnosis of chondromalacia or patellar tendinitis. In most cases, neither of these terms accurately describes the cause of this painful condition, which remains elusive and poorly understood. In attempting to discern the source of the client’s pain, an important question is whether it primarily involves the surrounding soft tissues or the patellofemoral articulation itself. Some clinicians (including myself) tend to lump patella-related symptoms into a category of chondromalacia. Since most researchers agree that nerve endings are relatively absent in articular cartilage, chondromalacia shouldn’t be labeled as the true anatomic cause of anterior knee pain. Chondromalacia is a surgical finding that denotes areas of softening of hyaline cartilage due to trauma or aberrant loading, but is not the cause of pain. Oddly, this shiny, smooth tissue underlying the patella and covering the surface of the femoral head receives the most accolades as a knee pain generator but is possibly the least innervated of all human tissues. I don’t mean to say that cartilage degeneration may not be a precursor to knee pain. Certainly, a roughened and degraded cartilaginous surface could impair mobility and joint function leading to irritation in surrounding tissues. But the anatomical source of pain in this area probably originates from compression and torsion to the richly innervated subchondral bone, infrapatellar fat pad, or medial and lateral retinacula. 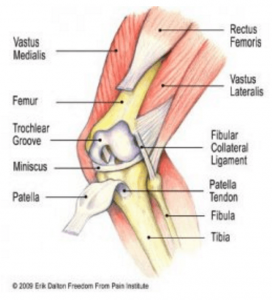 As the knee flexes and extends, the patella glides through the trochlear groove in the distal femur (Fig. 1). This patellar mechanism enhances leverage of the quadriceps by improving the angle of pull on the tibia. Resembling a shim (the thicker the better), the patella helps push the quadriceps tendon further away from the tibia to allow for more powerful knee extension – and powerful it is. The forces executed during knee extension exceed all other body movements. 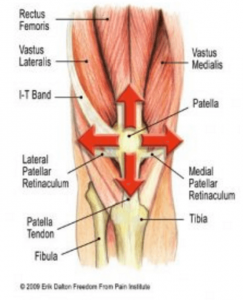 Surprisingly, much of the literature implies that the patella moves only in an up-and-down direction when, in fact, it also tilts and rotates. Imagine the massive forces the patella must withstand during hill climbing or squatting. Pressures per square inch under the patella rise to more than three times the body weight when climbing a ladder and greater than eight times the body weight during various stages of deep squatting…whew! Many believe that repetitive contact caused by maltracking of the patella is a likely mechanism of non-traumatic patellofemoral pain. Some of the factors believed to be the main culprits are: overuse or repetitive weight-bearing activities, arch variations – flat or high arches, wider hips and knock-knees (known as the Q angle), and lower limb muscle imbalances. Although I’ve had some success alleviating stubborn cases of patellofemoral pain using myoskeletal alignment and joint mobilization routines, I’ve found no consensus in the literature indicating that manual therapy procedures are of significant value. Regrettably, no solid (reproducible) research has surfaced to confirm that any type of medical or manual intervention is reliable. Having said that, I’d like to discuss a couple of strategies you might try when dealing with this illusive and pervasive condition. The therapist’s treatment goal is to eliminate excessive compressive and/or torsional forces at the patellofemoral articulation. (Fig. 2) Early in my days as a certified Rolfer, I’d place a dot in the middle of the kneecap and ask the client to slowly squat so I could observe the direction of the knee tracking. It was an interesting experiment trying to identify the painful knee strictly from my tracking observations. Surprisingly, I only got it right about 60 percent of the time so I abandoned the test and proceeded on to a more holistic evaluation that garnered better results. One common structural abnormality that seemed to respond better than the rest is depicted in Fig. 3. Basically, this drawing represents a person presenting with a pronated foot, internally rotated tibia, externally rotated femur and pelvic obliquity. As the tibia internally rotates, and the kneecap is being pulled laterally (squinting patella), strong torsional forces travel through the knee during gait. Tissue often builds up on the medial side of the knee as the stretch weakened vastus medialis recruits help from the adductor magnus muscle. Theoretically, during running, the person with this dysfunction would land on the lateral portion of the flat foot and roll inward, causing the lower leg to internally rotate. At the same time, vastus lateralis and iliotibial band (ITB) resist this motion by externally tugging on the lateral side of the kneecap causing increased friction between the patella and femur. Figure 4 shows an effective spindle-stimulating technique for tonifying the weakened arch muscles, mobilizing the ankle and foot, and correcting the internal fibular rotation. Neurologic coordination demands balanced and rhythmic lower extremity movement. An infant’s “cross crawl” pattern organizes many innate musculoskeletal functions at the spinal cord level permitting a smooth cross-patterned gate without thinking about posture and conscious planning of each movement. But when a foot maintains prolonged pronation, many global and core muscles forget how to “turn on” and “shut off” in proper sequence. This leads to altered posture, excessive efforting during normal movements and “kinetic chain kinks” that often manifest in the knee. In Figure 6, a fibular mobilization technique is applied to help lift the lateral arch and restore functional balance between the tibia and fibula. Myofascial manipulation and joint stretching routines designed to restore alignment, function and firing order are helpful, particularly when combined with home retraining exercises using elastic bands, loops and ball squeezes. Together, they can help correct aberrant tracking patterns decreasing the risk of injury. I find the vastus medialis a difficult muscle for clients to isolate so I recommend general quadriceps strengthening which includes a properly designed deep squat training program. It’s reasonable to blame much of the escalation of patellofemoral knee pain syndromes on our society’s transition from a population of movers to a nation of sitters. The advent of chairs has been one of the major predisposing factors leading to the prevalence of knee, hip and back pain in modern man. The deep squat position used for working and resting was, and is, an extremely beneficial exercise. Millions of people in Africa, Asia and Latin American countries still practice this very therapeutic squatting position. Contrary to popular opinion, I believe deep squatting exercises performed correctly are a very therapeutic adjunct for preventing and rehabbing certain types of knee pain.